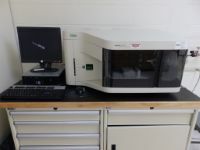 Bio-Rad CFX Connect Real-Time (Quantitative) PCR System (Do not reserve separately for NextGen) The CFX Connect system can be used for running and analyzing large gene expression studies. The system’s unsurpassed thermal performance plus its innovative optical design produce accurate, reliable data, and powerful, yet intuitive software accelerates every step of your real time PCR research. The optimal result could be collected using minimized amount of reagents and sample in very short period of time. CFX system can determine the concentration of generated DNA sample libraries prior to running them on the Experion 1K DNA chip assay and sequencing on the NextSeq 500. A qPCR validation/quantification will be required prior to sequencing for the accurate quantification of good quality libraries. The system is optimized for Bio-Rad factory calibrated dyes, but can incorporate reagents from different manufacturers. The CFX manager software allows for quick setup and analysis. Included in Next-Gen Library Prep QC- For all Experion runs, users must also reserve an RNA or DNA chip for their samples. TheBio-Rad Experion Automated Electrophoresis System is a chip-based microfluidic platform that performs all the steps of gel-based electrophoresis quantification and quality assessment of RNA or DNA (up to 1Kb) in 30-40 minutes, and only requires 1 ul of sample. The system incorporates automated chip priming, visual data reporting of electropherograms, complete analysis and export. Each kit comes with an appropriate nucleic acid ladder used to qualify and quantify user samples. ·	RNA – Standard Sensitivity Experion Kit: the Experion generates an RQI (RNA Quality Indicator) score (comparable to the BioAnalyzer’s RIN) for RNA as a critical quality check of RNA prior to preparing libraries for sequencing and other applications. The standard sensitivity kit offers sensitivity down 5 ng/ul with a range of 5-500 ng/ul. ·	DNA – 1K Experion Kit: This DNA on-chip electrophoresis assay is used to assess the average fragment size of sample libraries as a quality control metric prior to normalizing and preparing libraries for sequencing on the NextSeq 500. The maximum loading mass is 50 ng. This instrument needs to be reserved with the Bioanalyzer DNA, or RNA chip. This instruments is for the analysis of DNA, RNA, or protein. It is used to quantify and size these biomolecules. The system runs similarly to standard gel electrophoresis, however, the added advantage of this instrument is its ease of use, accurate sizing and quantitative ability. Note: This is a closed system so antibody detection, or probing is not possible following a run. See Bioanalyzer Instrument, the bioanalyzer chip should be reserved when running RNA on the Bioanalyzer.Do not reserve for NGS. Isolation of DNA and/or RNA from simple (soft) tissues or cells using our standard DNA or RNA isolation procedure. If working with a hard-to-lyse sample or a sample that is complex in nature, please contact Jack Lepine at Jack_Lepine@uml.edu to make arrangements for this work. Downstream applications may include PCR, qPCR, molecular cloning, CRISPR, or DNA/RNA Sequencing. One hour includes up to 20 samples. The Amnis® FlowSight® Imaging Flow Cytometer has three excitation lasers (405, 488, 642nm) and twelve standard detection channels that simultaneously produce brightfield, darkfield or side scatter, and up to ten channels of fluorescence imagery of every event at ~20X magnification with high sensitivity CCD cameras. 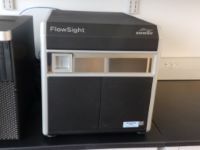 The FlowSight® provides users with the ability to gain detailed images of a large number of cells in a relatively short period of time and the opportunity to perform a range of novel applications including co-localization, internalization, stem cell differentiation, cell cycle, phagocytosis, and cell-cell interactions. The instrument configuration includes with fluorescence amplification and minimal noise detection that results in very high signal sensitivity paired with a powerful quantitative image (QI) processing option. Data files can be analyzed using Amnis® IDEAS® software for image processing alongside traditional gating strategies or saved in .fcs format for analysis through alternate software types (i.e. FlowJo or ModFit™). In addition to being able to see the cells displayed in dot plots and histograms, the imaging provides analysis tools not available in conventional cytometers such as texture and spot counting. Booking the Instrument: The time required for each sample is dependent on the cell concentration, the number of events needed and the complexity of the compensation strategy. A good general guideline for booking is 10 minutes per sample to start. Additionally, if your experiment requires a DNA dye or potential contaminants to subsequent experiments there will need to be a sterilization step (45min) which needs be included in the booking of the machine by the user. (This will be determined by BCL Staff when Data Acquisition Form is submitted and based on the experimental design.) We do not currently accept MRSA or BSL-2 samples. Do not reserve this instrument separately for NextGen. Rapid quantitation of DNA, RNA, or Protein. High Performance Liquid Chromatography (HPLC) Located in Saab/ETIC 308 HPLC is one of the most powerful tools in analytical chemistry. It has the ability to separate, identify, and quantitate the compounds that are present in any sample that can be dissolved in a liquid. HPLC could be used to understand the elemental composition of a drug substance, chemical substance, or food product. The CRF offers a C18 Reverse Phase column with acetonitrile, methanol, and water as mobile phases. Triflouroacetic acid is offered as a mobile phase additive. Qualitative and Quantitative analysis is possible. 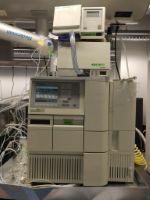 We offer an Agilent 1100 HPLC system equipped with auto-sampler and PDA detector. Up to 5 different wavelengths can be analyzed at the same time. Chemstation software controls the HPLC experiments and data anaylsis. Training takes 2 to 4 hours depending on type of analysis, experience, and method development. We offer training to become self-users as well as service options. Please contact wendy_gavin@uml.edu for questions, training or service. 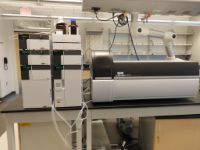 Shimadzu LC/MS Triple Quadrupole Located in Saab/ETIC 308 The Shimadzu 8040 Triple Quadrupole LC/MS is an analytical system that combines the separating power of liquid chromatography with the qualitative and quantitative power of mass spectrometry. Mass spectrometry detectors offer information including molecular weight, structural information, purity, quantity, and identity of sample. The LC/MS can analyze samples from small molecule to large proteins and peptides. It can measure a m/z ratio of up to 2000. Ionization modes include electrospray interface (ESI) and dual ion source (DUIS). Duis enables ESI, APCI, positive and negative ionization in the same analysis, significantly improving efficiency by simultaneously analyzing a wide variety of compounds in a single run. Data Acquisition modes offered are:	·	SCAN ·	SIM-selected ion monitoring ·	Multiple Reaction Monitoring (MRM) ·	product ion scan ·	precursor ion scan ·	neutral loss scan modes. Scanning in positive and negative modes occurs simultaneously. Using LabSolutions software, the LC/MS offers automation, method optimization, and data analysis techniques. 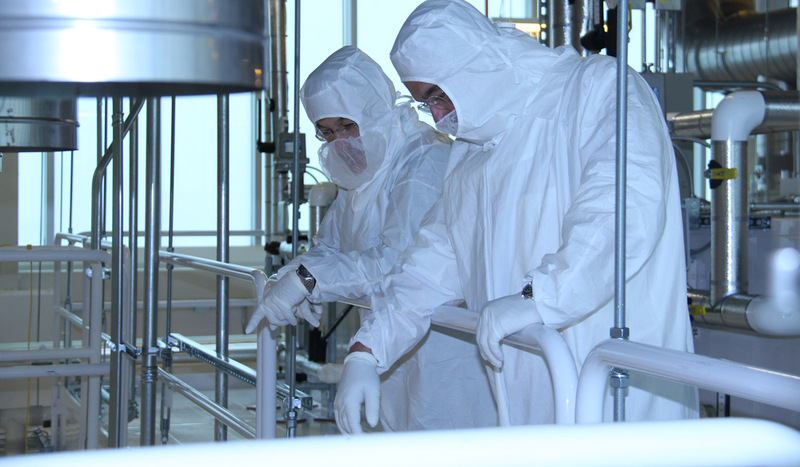 The CRF offers training to become independent users or services to run samples for our customers. We offer a C18 RP column along with acetonitrile, methanol, and water for mobile phases. Users are required to supply their own columns, HPLC methods, mobile phase additives, and a properly prepared sample. All mobile phases, columns, and samples must be approved for use in LC/MS before any analysis. Training requires 1 to 4 hours before self use. The scheduling of samples, training, and services must be approved by contacting Wendy Gavin at wendy_gavin@uml.edu prior to signing up for a reservation on the CRF website. Sequencing Rates per run. All pricing includes kits and total number of sequencing hours required per run. This instrument is used after DNA or RNA have been converted to NGS libraries at the core. 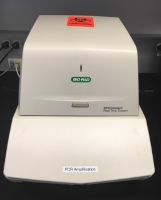 Sequencing menu NGS-High Output 300 cycles NGS-High Output 150 cycles NGS-High Output 75 cycles NGS-Mid Output 300 cycles NGS-High Output 150 cycles This instrument is used for sequencing DNA or RNA libraries to detect genomic variants in any organism. It can be used to detect single nucleotide polymorphisms (SNPs), insertions and deletions (INDELS), gene duplication events, and chromosomal rearrangements. Additionally, sequencing total RNA, small RNA, or mRNA can reveal information about gene expression levels, presence/absence of gene expression, gene splice variants, gene fusion events, and SNPs. Surface Plasmon Resonance (SPR) using Bio-Rad ProteOn XPR36 Located in Olney G-3 The ProteOn XPR36 protein interaction system is an SPR biosensor that provides real-time data on affinity, specificity, and interaction kinetics of protein interactions. The interaction analysis can look at interactions between DNA-DNA, DNA-protein, lipid-protein, and hydrid systems of biomolecules and non-biological surfaces. SPR can be used for antibody characterization, large and small molecule drug development, protein interface analysis, and protein complex and cascade analysis. One interactant is immobilized on the sensor surface (ligand), while the other is free in solution and passed over the surface (analyte). The ProteOn XPR36 offers the ability to monitor up to 36 different interactions in real time, by processing, in parallel, 6 different ligands with 6 different analytes. *Analyze up to 36 different protein interactions in a single run, on a single chip *Identify the binding of two or more interactants to each other *Determine the affinity of the interactions *Measure the association and dissociation rates *Screen multiple panels of analytes *No radiochemical or fluorescent labels required For the analysis of biomolecular interactions, the SPR uses ProteOn Manager software. ProteOn Manager offers easy to learn workflow, manual or automated processing, and wizards to simplify kinetic, equilibrium, and concentration analysis. The software generates reports of results including sensorgrams and graphs. Users will need to provide their own sensor chips, buffers, reagents, 96 well plates, and other materials specific to their experiment. To schedule experiments, training, or services for the SPR, please contact Wendy Gavin at wendy_gavin@uml.edu prior to signing up on the CRF. Training takes from 4 to 6 hours depending on experience, qualitative analysis or quantitative analysis. Fragment DNA to between 150 bp and 5000 bp. for downsteam experiments such as molecular cloning or Next Generation Sequencing.